If it’s true that all art is political in one form or another, one thing certain can be said about the visual arts in Omaha in 2011, and that is, very little of it was political, or for that matter, controversial. In a year dominated by politics and predictions as prelude where were the arts events and exhibits that celebrated, satirized or expressed our national, regional or local concerns and conscience? Or are area artists just saving it up for 2012’s election year rise and fallout? But are area artists motivated by similar social and cultural issues, local or otherwise or are they too busy just making ends meet and being seen? Valid concerns, especially in a community consumed by sports entertainment and going out to dinner. But there are visionaries who believe that art can be conduit for change. That it’s worth the money, time and effort invested. And, as they say, there’s no time like the present. In short, where were the art happenings in 2011 as moving and inspirational as Extraordinary Rendtion, the controversial collaboration of Tim Guthrie, Doug Hayko and others that held political court in the Bemis Underground in November of 2010. The truth is, other than the Femme Folles exhibit at RNG Gallery and particularly the startling imagery of Rebecca Herskovitz, there weren’t any, and if this extraordinary exhibit proved anything, it was that contemporary art in the 21st century must not only adapt but reinvent itself if it’s going to be art, for a change. That said, what follows is a review of the arts events and exhibits that, in the opinion of this critic, made his six annual A-list and 2011 a little more bearable and memorable for something other than the entertainment, economic and political status quo. 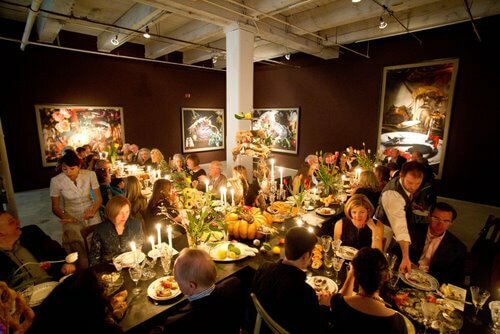 For pure cultural enjoyment there was not a single event more significant than the dinner hosted by the Bemis Center for Contemporary Arts to honor the Still Lifes of photographer and arts maven Vera Mercer. A multi-coursed meal and wine-tasting by Chef Paul Kulik of his Boiler Room restaurant extraordinaire and enjoyed in the gallery surrounded by Mercer’s 2D and 3D still lifes of food, flora and fauna, it truly was a hedonistic, Sybaritic night to remember. Not as successful was the event that honored the deserving 2010 art winners of the Omaha Entertainment and Arts awards. They included Leslie Iwai, Rebecca Herskovitz, Claudia Alvarez, Mary Day and Therman Statom. The event, held at Harrah’s Casino, did a fine job presenting the music and theater honorees, but the visual artists get lost in the mix which is poorly attended by the arts community at large. That and a less than satisfying popular voting process in the visual arts categories would suggest it’s time for a change. (Full disclosure: yours truly is a member of the visual arts committee in the OEAA). On a happier note for local artists are recent openings and movings for two very different galleries. RNG, owned and operated by Rob Gilmer relocated in Council Bluffs in a space effectively shared by Dixie Quicks, owned by Chef Renee Orduna, Gilmer’s partner in life as well. Artist Larry Roots, owner of Lincoln’s Modern Arts Midwest, opened a new space at 36th and Dodge Street called appropriately Modern Arts Midtown. RNG has catered to the edgy work of emerging artists in the past, and MAM has already demonstrated an interest in adding such to its stable. Three shows held last year were more like notable events as they not only made a similar distinction between established and emerging artists but honored them as such. The Nebraska Arts Fellowship Winners chosen by the NAC, including top honorees Jamie Burmeister and Liz Vercruysse as well as Anthony Hawley, Michael Morgan, Francisco Souto, Therman Statom, Peter Walkley, Mary Zicafoose and Mary Day, were exhibited at Bemis in Another Nebraska, curated by the venue’s chief curator Hesse McGraw. Conversely, Bemis held its first Regional Juried Exhibition in its Underground. Judged by Kate Hackman, the associate director of the Charlotte Street Foundation in Kansas City, this very talented, eclectic show awarded such emerging artists as Alexandra Borovski, Kan Seidel and Brittan Rosendahl. And thirdly, predominantly pre-emerging artists got their due thanks to the efforts of Josh Powell, assisted by Kevin Rooney, who held a mega pop-up weekend exhibit at Urban Storage featuring nearly 100 of varying interest, talent and commitment. The area arts community looks forward to more of this DIY effort. Last, and certainly not least, two arts organizations, one firmly invested on behalf of contemporary art, the other just beginning, made significant progress in 2011 toward that end. The Bemis Center, celebrating its 30th year, completed an 8000 sq. ft. renovation of its third floor to add five new live-in studio spaces to its internationally known residency program. Fresh on the heels of the successful Kent Bellows mentoring program that enables high school students in after school arts programs, the newly organized Union for Contemporary Art and its founder/director Brigitte McQueen announced the recent purchase of two buildings in North Omaha for its home base. Though UCA is also dedicated to providing arts programs for Omaha’s youth, its mission is to “enable a broad and diverse audience to create an inclusive arts community…regardless of socio-economic background.” In other words, three separate venues united by their desire to effect social change through art. On a less didactic note we offer the 2011 A-list, the best, most interesting exhibits seen and/or reviewed by myself and two staff arts writers, Sally Deskins and Mary Day. The A-list consists of 16 shows in three tiers as well as three honorable mentions taken from over 50 arts stories written by the Reader last year. The three honorable mentions include: Jim Krantz’s fine solo effort at Anderson O’Brien Gallery, Generations Shared: A Tribute to Artist David Bialac, his grandfather; Old Friends-New Work, another tribute, this time, a group show at Hot Shops that served as a reunion of the former 13th St. Association that proved they “were still doing it”; Les Femmes Folles, curated by artist Wanda Ewing at RNG, this group of women artists is still finding its way and vision, but this exhibit set a worthy precedent. The bottom tier awards bronze medals to the following five shows that though uneven or inconsistent were well worth some face time: Tops on this list was Sorcery, curated by artist Humberto Chavez for the Moving Gallery which featured works on paper from the Independent Artist Workshop of the Center of Education in Graphic Art, La Parota; next in line is James Freeman’s mesmerizing solo, Studio Stories at Hot Shops. Freeman’s vision is playful, disturbing and always something to look forward to; Mixed media artist Jeff King also gave us something to anticipate with his street-art influenced solo, The Newest Edition at RNG. His work has become more personal of late and that’s a good thing. Also in the third tier is Golden Guts, a challenging and mostly satisfying two-person exhibit at Bemis Underground from Josh Powell and Kim Reid Kuhn whose mixed media and neo-abstraction proved that “all that glitters is not gold.” Last but not least was another two-person show, Positive Space, at New BLK which featured contemporary sculpture from Justin Beller and digital prints from Daniel Muller. Together they demonstrated the positive use of negative space. The second tier awards six silver stars to the following arts and shows that exhibited mature, unified work from both established and emerging artist: Chief among them was a gifted variation on Portraits at the Moving Gallery from two German photographer/artists, Christian Rothmann and Gerhard Kassner; Kristin Pluhacek stretched beautifully at Lauritzen Gardens with Weeds/Pods/Seeds and the Landscapes, especially the latter, full of interesting and moody narratives; two additional solo exhibits came from very different artists, Eliska Morsel Greenspoon and Nolan Tredway. The former showed another set of sophisticated mixed media photo prints at the Fred Simon Gallery that commented visually on the environment and human condition. Tredway dealt with similar themes at New BLK with his paintings in Lost Ends, but his narratives were personal, figurative and surreal. Two more superior duo shows complete this tier: Line by Line by Line, that combined the sculptural “cuttings” of Susan Knight and the sensual, organic and figurative photography from Rob Gilmer into a study of visual poetry; Conversely, the mixed media of Nic Bohac and ceramics from Mike Roche in their splendid show in the Underground, Nothing and Everything at Once interpret man’s relationship with his environment in more socially abstract and conceptual imagery. Finally the top tier reveals a gold standard of the five best exhibits in 2011. If you missed any of these you missed being taken to another place. In reverse order there was Waseem Touma’s Emergence at RNG, an amazing display of orbital sculpture, murals and installation that nearly defied description in its metaphysical exploration of man’s connection to nature. Next there was Roberto Kusterle’s exotic and experimental photography at the Moving Gallery that placed his portrait into a series of surreal narratives and hybrid realities. Third, there was the finest display of public art in nature in Outside Kaneko that placed the master’s monumental Dangos and abstract drawings throughout the 100 botanical acres of Lauritzen Gardens.